Twin Brothers, telepathically connected, have developed a new form of plant life, supposedly to help with the world food supply. But the more powerful of the two (Ben) has plans of a power play, using the plant creatures as an army or something -- it's never made particularly clear. 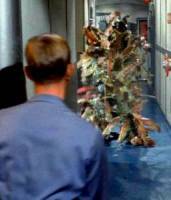 As Seaview approaches with Ben, on board, Ben orders brother John, at a sealab on the ocean floor, to complete the experiment. Unable to resist, John throws a big honkin' switch which causes multiple fireworks, including a reactor explosion which creates a giant plant monster. 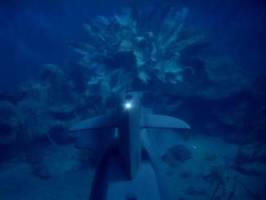 The creature attacks the Flying sub with Nelson and Ben aboard as it approaches the sealab. Nelson sends out a distress call and Seaview steams at flank speed to intercept. Seaview arrives and rams the creature, giving Nelson and Ben time to swim out to escape. Nelson smartly heads for Seaview, while Ben heads for the undersea lab to join his brother. The giant creature gets blasted to bits with a laser and Nelson orders remnants of it brought aboard for study. 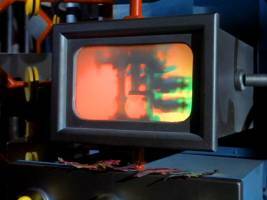 John is brought to Seaview and Sharkey and Crane wind up captives of Ben in the sealab. 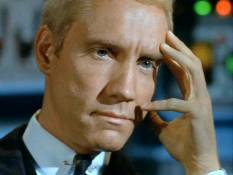 Ben telepathically orders John to take the plant remnants to the reactor room. What's on the telly? At least it's in color. There, he exposes them to radiation and voila--plant men subject to Ben's destructive will. After much see-saw action John gets the upper hand, and when his brother orders him to shoot the plants with a laser gun (this will create more plant men -- go figure) he manages to turn the gun on Ben instead. Lettuce get out of here. 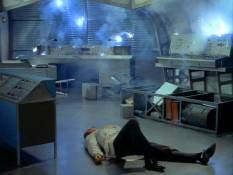 In typical third-season style, Ben disappears in a puff of smoke. That in spite of the fact that this show had a steep effects budget. The plants are subsequently dispatched by Nelson who concocts to go after them with conveniently placed lox canisters, freezing them, thus providing a chilling climax. 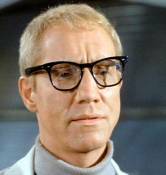 Mark Says: William Smithers specialized in playing either cold, calculating villains or weak good guys. Here he gets to do both and he does well. 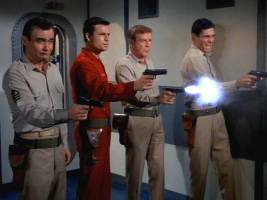 The episode can�t be taken seriously - the plant men run around like Tasmanian Devils and was someone putting us on with that wild west shootout at the end, as our heroes stand side by side, blasting away at the plant men? 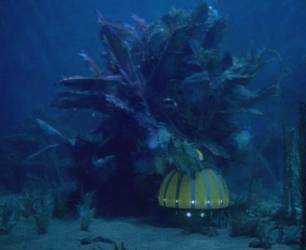 But it moves along nicely, with excellent undersea photography and special effects that really boost the episode. 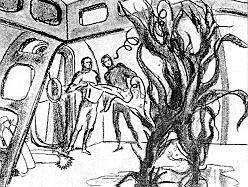 Mike Says: Surprisingly good undersea effects of the giant plant, the undersea lab and flying sub, all wasted on an idiotic story. There is no explanation as to why Ben is so evil and no justification for his thinking an army of giant underwater plant men would do him any good. Bottom line: fabulous miniature effects and lazy writing and music cues make for an episode watchable primarily for the miniatures, of which the first half of the show has plenty, and for the acting. Once again, the cast, including guest William Smithers, does an amazing job of giving straight dramatic treatment to laughable material; it is too bad the writing didn't match their talent.